So this happened. And it was wonderful. This pie qualifies as the best summer thing I have ever made. EVER. 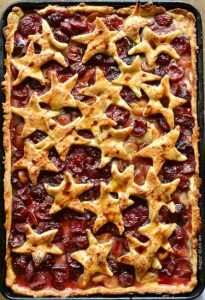 It’ll be awhile before I top it (unless you count adding a scoop of Sweet Cream Apple Butter Ice Cream on top because that would be like the pinnacle of summer food dreamin’), so just get on board with this slab pie full of cola-soaked cherries and let’s enjoy it for awhile. Are you loving all the summer produce right now? I am seriously binge-buying all of it every time I stop at the store for anything. Laundry detergent? Brought home grapes. 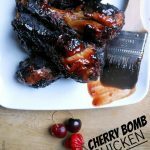 Charcoal for the grill? 4 pounds of peaches. Deli meat for lunches? 2 huge bags of cherries. Then I made the mistake of putting the cherries in the fridge until I had time to work out this pie brain child of mine, and Chad got to them. He demolished half a bag without blinking and then called me to tell me he got into the cherries. Let’s talk about what I did with the cherries I salvaged from my ravenous other half though. I soaked them in cola, tossed them with sugar and cornstarch, and then poured them into an all butter pie crust that I pressed into a baking sheet. THEN I took the cola and cooked it down into a syrup that I drizzled over the finished pie. So easy! Have you made a slab pie yet? I have to say that I am totally a fan of pie crust that does not require perfection. I have never been very capable of the whole perfect pie crust thing. I suppose I could work it out with a little practice, but I’d rather get to the pie eating part. Slab pie is the best kind of enabler in that respect. This recipe is enough for a double pie crust so I rolled 2/3 of it into a rectangle and fit that into my baking sheet. I rolled out the rest and got crazy with all the stars I could manage. You could try a lattice or hearts or whatever fun little cookie cutter shape you want. Ice cream on top is not obligatory – especially since you can technically eat this slab pie with your hands. But in my eyes ice cream on top is always recommended. 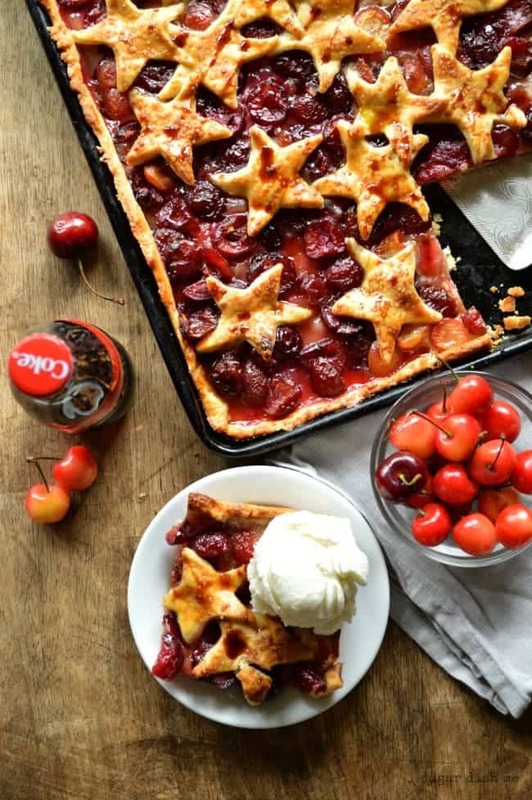 Fresh cherries soaked in cola and then baked into an all butter pie crust. 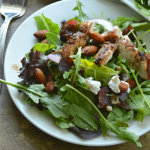 This is a terrific easy recipe using tasty summer produce! 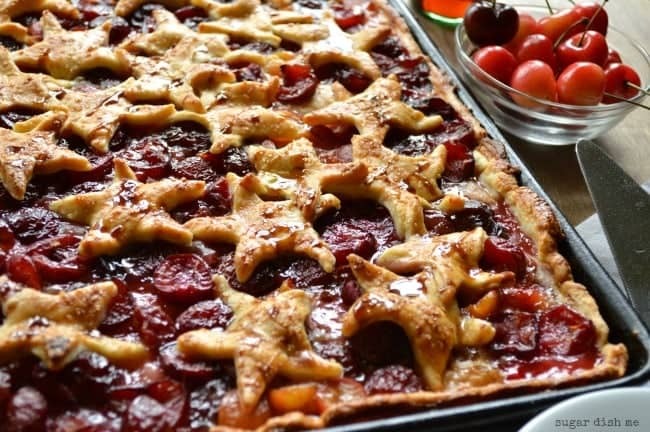 Be sure to allow yourself at least an hour to chill your pie dough and soak your cherries before you are ready to bake (prep time includes the chill time). To make the pie crust, whisk together the flour, sugar, and salt. Cut the cold butter into the flour mixture until coarse crumbles form and the butter is dispersed evenly. Add 4 tablespoons of ice water and stir to combine. Add one more tablespoon and then one more as needed to get your dough to the right consistency. Divide it into thirds. Smash ⅔ into one big ball and ⅓ into one little ball. Wrap them in plastic and let them chill for at least an hour or overnight. While the dough chills, prep your cherries and put them in a bowl. Pour the cola over them and refrigerate for at least 45 minutes (they should be ready when the dough is). On a lightly floured surface, roll out the large ball of dough into a rectangle and fit it into a 13 X 9" ungreased baking sheet with a lip around the edge. Drain the cherries but reserve the cola in a small saucepan and set aside. Toss the cherries with the sugar, cornstarch, and salt. Pour the filling over the crust and spread it out evenly. Roll out the small ball of dough and cut out as many shapes as you can. Place them over the top, overlapping if you need to. Whisk together the egg + tablespoon of water and brush all the pie crust across the top, plus the edges all the way around. Sprinkle with the turbinado sugar and bake for 25 - 30 mins. The crust will be golden and the filling will have thickened when it's ready. 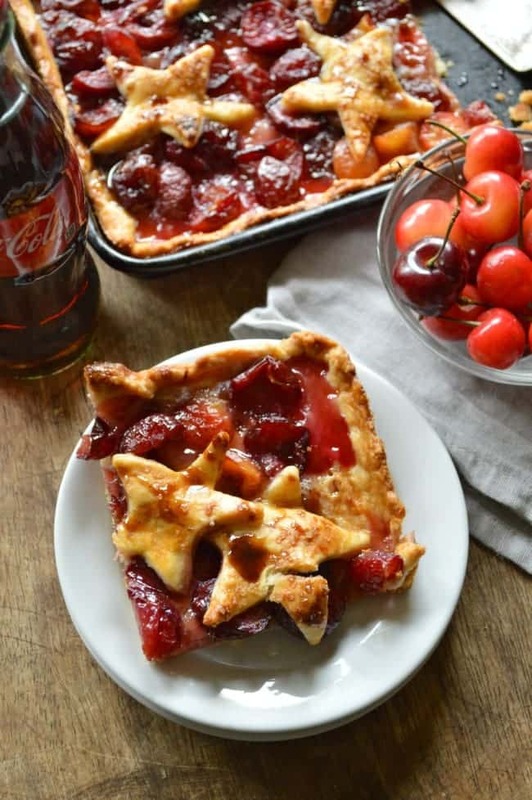 While the pie bakes, put that pan with the reserved cherry flavored cola over medium high heat. Let it cook and simmer for about 15 minute until it thickens into a syrup. It will reduce by more than half. When your pie comes out, drizzle the syrup over the top. slice, and serve. Amazing! And so beautiful! I have been totally obsessed with cherries this year, I just can’t get enough!! So this is right up my alley! Me too!!! Cherries are where it’s at right now! 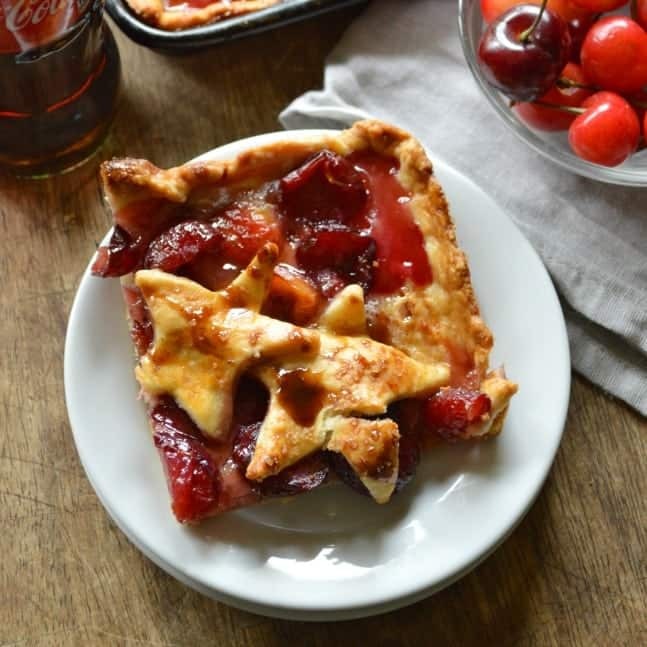 Such a gorgeous pie – can’t wait to try it since cherries are no available and in season! Yeah they were totally $6 a pound but worth it. Thanks so much Kacey! I’m going to go to bed dreaming about this pie and a BIG scoop of ice cream right on top! Oh so good! Oh my GOSH I love this pie! 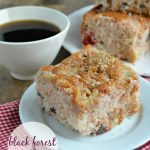 Loaded with cherries and drizzled with cola syrup?? You are a GENIUS, Heather! Cola syrup is the new hype. hahaha. 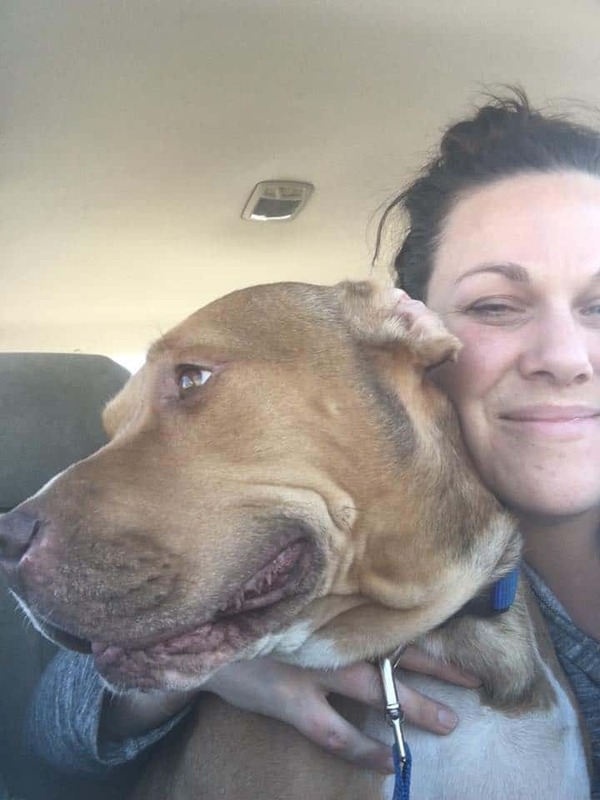 Thank you Cathy! I love the idea of a slab pie – such a great idea! This pie looks fantastic, I love all the cherries! 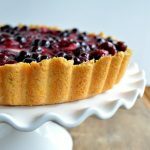 This pie is stunning! And I’m dying to try it with the cola in it. Sounds amazing!